Murcien's Hamlet is a small village in northern Bangkorai, north of Evermore. 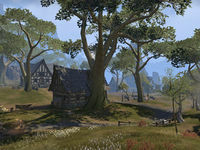 It sits on the shore of Halcyon Lake and most of its' residents are involved in the fishing industry and sell their goods in nearby Evermore's markets. However, it also has been the target of the Reachmen over the years, such as during the Black Drake's invasion of Bangkorai. After a pause of a few decades from Reachmen raids, the settlement has recently been invaded by the Dark Witnesses and the disastrous result of the calvary charge in response has left the village in a precarious place. Murcien's Hamlet Objective: Help the Evermore Troops at Murcien's Hamlet. The Charge of Evermore: Help the Evermore guard defend a village from Reachmen raiders. Most of the people found here are survivors from the Evermore City Guard which came to fight the Reachmen. †Only appears during related quest. This page was last modified on 4 February 2019, at 22:39.